On March 19th I flew from Chicago to New York City to attend the 2012 Publishing Business Conference and Expo. My primary goal in attending the expo was to answer an important question—a question my colleagues and I have been discussing for quite some time: Should the Great Books Foundation produce electronic book anthologies? The expo provided a great opportunity for me to meet other publishers and learn how they are approaching the rapidly expanding e-book market. I was heartened to learn that many of them seem to be in the same place as the Foundation and that there is a great sense of optimism about the potential for e-books. A session conducted by Tom Burke, the chief of e-commerce at Scholastic, Inc., was especially informative. Scholastic’s mission is to "encourage the intellectual and personal growth of all children, beginning with literacy." Although Scholastic is a for-profit publisher, it’s similar to the Foundation. Scholastic has a wide-ranging audience in both the trade and educational markets, and it maintains long-standing relationships with its readers. I was happy to hear that Scholastic views e-books as a natural evolution that is consistent with their mission. I believe that the same applies to the Foundation. If we are to move into the realm of e-books, we face a series of challenges. 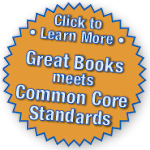 We need to determine what type of enhanced reading experience we want to provide our readers in both K-12 and Great Books Discussions markets. Scholastic, for example, has created a reading application called Storia, but also believes that potential reading enhancements such as music or games must be subservient to actual content story. The Foundation will also need to invest in both staff and technology, and negotiate permissions with the rights holders for all our non-public-domain works. These are significant challenges, but I believe we can overcome them, and in the long run we will greatly improve the quality and scope of the Foundation's products and services. Patrick Hurley is Production and Permissions Coordinator for the Great Books Foundation. He also writes speculative fiction, and his work can be found in the magazine Big Pulp, the e-zines Darker, Allegory, and Niteblade, and audio fiction podcasts The Drabblecast and Cast Macabre. When not training for marathons, he is at work on his first novel. Brought together by the auspices of Classical Pursuits, which hosts discussion-based learning vacations all over the world, I and eighteen discussion participants spent three days exploring several of O’Connor’s short stories while going to see the places she lived and worked. It’s one thing to read “Good Country People”; it’s another to discuss it deeply, and still another to discuss it sitting in the living room of the row house where O’Connor grew up. On this shady square in Savannah, across from the Catholic cathedral where O’Connor was baptized, it’s possible to feel the reality of this woman who struggled fiercely to bring her particular gifts to fruition against daunting odds. Those words take on new force when standing in the small Catholic church in Milledgeville where O’Connor and her mother went to Mass every morning, and still more when standing on the front porch of Andalusia, the farm where she and her mother lived during most of O’Connor’s writing life. O’Connor’s untimely end was underlined for me by hearing Mary Barbara Tate, one of the last surviving members of the book club that O’Connor hosted, talk about her memories of the author. That I could meet someone who remembered the person who wrote “A Good Man Is Hard to Find” and “Everything That Rises Must Converge” -- that seems unbelievable. What might O’Connor have written if she’d had just a few more years? As I stood in the doorway of Flannery O’Connor’s bedroom, which was also her writing room, it was the crutches I kept looking at. They lean matter-of-factly against the wardrobe, a visible symbol of the burden of ill health O’Connor carried with such grace. Pity for her is unnecessary—if anyone with a chronic illness made the best of her life, she did—but seeing the crutches of this woman who achieved so much against such odds and died younger than I am now filled me with a curiously personal feeling of loss. That sense of loss was tempered by the peacock and peahens that are now living in Andalusia’s aviary. At one time O’Connor had 40 peacocks. She called them the “king of the birds” and saw their extravagantly beautiful tails as evidence of the beauty and power of God. Each peacock’s tail, she has one character in “The Displaced Person” remark, offers a “map of the universe.” Watching the current peacock stalk about proudly, regally lifting his gorgeous tail off the ground, I thought of the deeper continuities that underlie change and mortality. O’Connor steadfastly believed in the reality of the eternal and the unseen, and viewed her own decline and death unsentimentally. She said she would “gladly swap 100 readers now for 10 readers in 10 years or one reader in 100 years,” so she’d be pleased that her fiction continues to gain readers and to garner more critical praise. But I think she’d be happiest of all that that fiction challenges and enriches all those readers willing to engage deeply with it in discussion. After exploring O’Connor’s works in depth, it’s impossible to see the world quite the same way again. To read another blog entry about this trip, from the viewpoint of Ann Kirkland, the founder of Classical Pursuits, click here. Nancy Carr is a senior editor at the the Great Books Foundation, working primarily on choosing reading selections and writing teacher's materials for grades K–8. She also leads literature discussion seminars for adults, independently and with the Classical Pursuits travel learning program. The weekend began at the Art Institute of Chicago, where attendees viewed six different artworks, including Death of the Poet Walter Rheiner by Conrad Felixmuller, Auguste Rodin’s sculpture Eve After the Fall, and Portrait of Marevna by Diego Rivera. Discussion leaders shared background information on each work and opened discussion relating the work to the weekend’s theme. The first Shared Inquiry discussion focused on William Shakespeare’s Timon of Athens. One of the bard’s lesser known plays, it tells the story of Lord Timon, who is overly liberal with his money and gives it away freely to his friends. His generosity catches up with him, and Timon finds himself in enormous debt. It was a challenging play to discuss, even for participants well-versed in Shakespeare. However, a Shared Inquiry discussion can shed light on difficult material, and the discussion was spirited, especially on the subject of Lord Timon's nature, and the question Whom should we blame when things fall apart? Participants also attended a performance of Timon of Athens at the Chicago Shakespeare Theater, and the production provided a possible answer to this question. Director Barbara Gaines’s Timon of Athens features a modern Wall Street-like setting, and Lord Timon is not portrayed as innocent in his downfall. By joining Shakespearean themes with a modern setting and timely issues, the production brought to life the story that many had struggled to understand. Saturday began with a discussion of Chinua Achebe’s Things Fall Apart. The novel tells the story of Okonkwo, through whom we learn about the habits and rituals of a Nigerian tribe and come to know a man determined to achieve power and respect, in contrast to the failures of his father. Okonkwo’s plans are disrupted when white missionaries enter the Niger with plans to "reform" the tribe. Though the language is simple, the book is complex. Its depiction of a powerful male figure’s demise connected the novel with Timon of Athens, and raised the question When do things begin to fall apart? Following lunch at Maggiano’s there was a brief welcome talk and then a performance by BoyGirlBoyGirl, which consisted of four spoken monologues, including one by Great Books Senior K-12 Editor Rachel Claff. Each monologue shared a personal experience, reflecting a time for the speaker when things were falling apart. On Saturday evening attendees were free to explore Chicago on their own. The final discussion, on Sunday, focused on a selection of poems, including “Ozymandias” by Percy Bysshe Shelley, “Spring and Fall: To a Young Child” by Gerald Manley Hopkins, “The Armadillo” by Elizabeth Bishop, “Reality Demands” by Wislawa Szymborska, and “The Second Coming” by W. B. Yeats. The discussion question was Should we resist things falling apart? Tackling five complex poems in a 90-minute period was a challenge, but the conversation was emotionally moving, and at times somber, as participants reflected on life and its tragedies. The final event of the weekend was a talk by Great Books Foundation chairman of the board, Alex Pollock, who discussed things falling apart as related to the economy. Pollock provided a positive perspective on the weekend's theme, demonstrating that economic failure (or “bust”) is part of a cycle that has happened over and over again throughout the centuries, and that after a certain period of time, things will come back together. Great Books Chicago is a wonderful opportunity for anyone with a desire to be intellectually stimulated and culturally entertained. Especially meaningful are the connections people forge with with one another during the weekend—connections which are easily made because everyone already shares a love of reading, learning, and discussing. Kristine Bergman is an editorial and marketing assistant at the Great Books Foundation. She is a recent graduate of Amherst College in Massachusetts and will enter Loyola University Chicago School of Law in the fall.